Play is more than `not work’, in many aspects it works as an entertaining and powerful motivator, especially in the form of physically active embodied interaction. 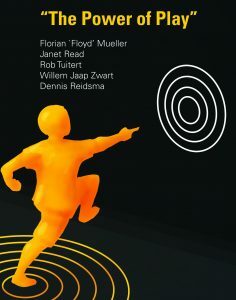 In this symposium we celebrate the topic of the PhD defense of Robby van Delden—he will have his public defense on (Steering) Interactive Play Behavior (http://robbyvd.com/thesis_small.pdf ) before the actual symposium starts, at 12.30 in the Waaier 4 at the University of Twente. We have invited 6 speakers to give short inspirational talks related to interactive playful activities from different perspectives: design of exergames, interaction for children and evaluation thereof, commercial development of outdoor play, the perspective of the client in a cultural context, playful interactions, and a holistic view on play with impact. Interesting for everyone with research, educational, or personal interests into these topics or perspectives. 15.00 – 15.25 Professor Florian `Floyd’ Mueller is a world leading researcher known for the design of exertion interfaces and distributed games, and is currently co-director of the Centre for Game Design Research and leading the Exertion Games Lab within it at RMIT University, Melbourne, Australia. 15.25 – 15.50 Professor Janet Read is internationally known for her work on designing and evaluating technologies for children as well as for her work on text input with digital ink. She is currently working at the University of Central Lancashire as a professor in Child Computer Interaction. 16.00 – 16.20 Rob Tuitert is a successful industrial designer at Yalp, where he was involved in the design of the Yalp Sona, one of the first interactive playgrounds for outdoor play, a system known and sold around the world. Together with his colleagues he worked on and created many other intriguing outdoor play installations. 16.20 – 16.35 Willem Jaap Zwart, is the director of Concordia, a local cultural organization providing multidisciplinary professional art to the people in Enschede and the surroundings. A core goal of Concordia is to bring art closer to the people. To this end they have also hosted many interactive installation at the heart of the city. 16.55 – 17.15 Dennis Reidsma is an assistant professor working at Human Media Interaction, with years of experience on the development and research surrounding ambient entertainment. With an increasing focus on the play aspects and societal impact, he now describes these endeavors eloquently as play with impact. Afterwards from about 17.15 to 18.15, there will be some demos and an opportunity to interact with –and ask question about– some of the use cases that were part of the thesis of Robby van Delden. It might also be a good place to get into contact with other people and students with shared interests from throughout the country and beyond. Entrance is free, however if you plan on attending (and haven’t notified us) reserving a spot is mandatory, please fill in the form https://goo.gl/forms/9BTNhAIYTHXwVLiN2 , there are currently only about 30 spots left and we will try to close registration as soon as this number reached. We look forward to celebrate the power of play with you! If you have any questions, please do not hesitate to contact me and/or my paranymphs Jan-Willem Bullée or Merijn Bruijnes via robbyvddefense@gmail.com.